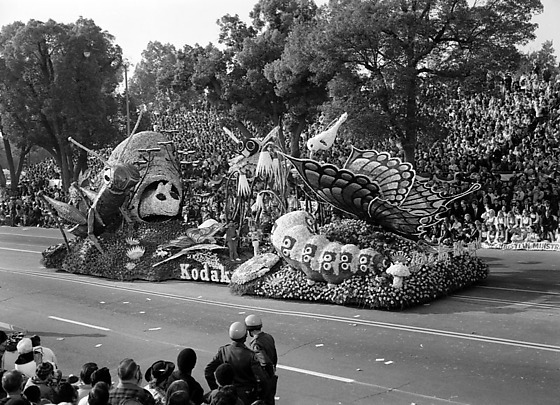 Tournament of the Roses parade floats with "Thru the eyes of a child" theme in Pasadena, California, January 1, 1971. Includes floats made of flowers and plants sponsored by state of Georgia and Kodak on street past grandstands filled with people. 1N: San Francisco dragon float with four people walking under undulating body on street. Dragon has bulging eyes. 2N: Marching band in white uniforms. 3N: Georgia float with two women full skirted gowns sitting in swings hanging from tree with split trunk and white layers covering branches, and a woman standing next to "Georgia" sign. Won the Sweepstakes award. 4N: Kodak float of giant insects with an African American boy and Caucasian girl waving at crowd. Includes butterfly, snail, caterpillar, grasshopper, bee and hummingbird. Typed on original envelope: Pasadena Rose Bowl Parade.